It's often been said that music is one big melting pot of influences drawn from different aspects of the arts. The independently-released 'Fire And Stone', the first full length album from Chicago-based singer/songwriter duo The Gray Havens, is certainly a case in point. Comprising of married couple Dave and Licia Radford who describe their sound as "narrative pop folk," the group's ability to create new worlds in their songs through intricate storytelling - owing as much to certain literary giants as any musical influence - has brought them a growing number of supporters. Fittingly, the genesis of The Gray Havens has an almost fairytale quality to it on a par with the inspired "Jack And Jill, Part Two" - a stand out track from 'Fire And Stone' which showcases chief songwriter Dave Radford's innate skill at turning something familiar into a striking analogy about the Kingdom of God. Back in 2007 and whilst still at school, Dave auditioned for US talent show American Idol and, thanks to skilled performances of songs made famous by the likes of Frank Sinatra and Louis Armstrong, he succeeded in reaching the show's last 20. Meanwhile, in a neighbouring Chicago town, his future wife and Havens co-vocalist Licia was alerted to the fact that a local boy was appearing on Idol and, months later, the pair unexpectedly met when his parents started attending Licia's church. Drawn together through a common love of literature, Dave and Licia eventually began dating before discovering a musical compatibility which in turn led them to start singing and performing together. Whilst Dave's appearances on American Idol saw him impressively take on the guise of crooners such as Sinatra, Michael Buble and Harry Connick Jr with aplomb, the newly married couple's 2013 debut - the six track EP 'Where Eyes Don't Go' - saw him venture down a completely different stylistic road. 'Where Eyes Don't Go' grabbed the attention of listeners and reviewers alike on account of their strong narrative nature. 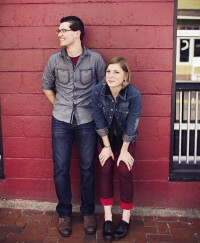 Spurred on by the EP's relative success, the couple soon began putting together songs for their first full length album and, with the help of Grammy Award-winning producer Mitch Dane (Brandon Heath, Jars Of Clay) and Jars guitarist Stephen Mason, 'Fire And Stone' hit the shelves in 2014 to critical acclaim. Add to the picture the recent arrival of their first child Simon and life has never been more fulfilling for the musical couple. I asked Dave how 'Fire And Stone' came about. "We had about 10 songs for the album when we first started the process of recording it. We were really blessed to be partnered with producer Mitch Dane from Nashville and he helped us to shape the sound and arc of the whole thing to allow it to sound like a cohesive album. We are really happy with the end result and it's gotten a great response - and we're grateful for that." It seems that Dave and Licia were initially keen to release the album without delay but were encouraged to hold fire for a while. "We were actually going to put it out a year before we did because we'd finished it. At that time, we'd signed up with new management and they advised us to wait for a year to get us ready for being in the public eye and to get music videos and a website together. If we had released it when we were originally going to, I think we would still have had a response but it would have just been from our friends and people who heard about us through our first EP. It's not like we have a huge pool of fans now but our publicist has helped us get the album out to a wider audience. We're just amazed that we've got a good response - people have had some very nice things to say about the album and it encourages us to keep going." The positive reaction to 'Fire And Stone' is in no small way thanks to Dave's ability to build a song into a story through lyrical imagery and I ask him how he came to write material with such a strong narrative. "Authors like JRR Tolkien and CS Lewis bring a lot to my songwriting and our band name is a reference to a place featured in Lord Of The Rings," Dave advised. "When I read The Chronicles Of Narnia for the first time, I remember being so excited that CS Lewis' stories were ultimately pointing to Christ. As I was reading, those ideas became so engrained in my thinking that it began to work itself out in my songwriting and, in some ways, my songs mirror Lewis' or Tolkien's approach of painting pictures with words. Now, I don't think either of them necessarily set out thinking that they would reflect Christ this way or that way but it was so much a part of them that it overflowed into their stories. I think that's more or less what happens with our songs - we tend to write about what moves us most." A prime example of using storytelling techniques in song can be found in arguably the standout track on 'Fire And Stone' - the genius "Jack And Jill Part 2" which begs the question of how someone would even consider writing a follow up to one of the most famous nursery rhymes of all time. "I was trying to find a way for the character in the song to enter some sort of other worldly environment so I pictured someone falling down and hitting their head and then waking up in a dreamlike state," clarified Dave. "That idea then reminded me of the nursery rhyme Jack And Jill and then that brought me onto Mary Had A Little Lamb which led to me thinking about Christ being the lamb and so on." Continued Dave, "With 'Jack And Jill Part 2' and other songs, I will agonise over the lyrics for weeks and I'll get chords and a melody that I like to form an outline of a song and then I'll take walks - sometimes hours at a time - with a notepad in my hand. The lyrics are something I'm very picky about and I don't want any filler words or throwaway lines in our songs!" Dave's perfectionist approach to writing lyrics has paid off. Said Dave, "We recently got an email from someone who was giving Christian music a try for the first time. One of his friends gave him our album and, in his email, he thanked us for making the record and basically said that if we could sway him towards a positive disposition in relation to Christianity then we could sway anybody. It's encouraging to hear that kind of thing." On the duo's album release Dave was keen to explain the relevance of their album title. "The title 'Fire And Stone' is really a metaphor about distinguishing between what really fuels joy, and what merely pretends to. It's about true joy versus counterfeit joy. A log thrown on a fire will fuel the flame and generate heat by giving itself and being transformed. A stone placed in that same fire will absorb heat and will seem hot to the touch, but it's not actually sustaining anything. It's like a short-lived feeling of happiness, but it's a counterfeit, not a source of true joy, and the stone will eventually contribute to the dying of the fire. 'Fire And Stone' is about that fight for real joy." I suggested releasing an album of narrative pop folk through imagery-filled songs that point to the Kingdom of God is a quantum leap from appearing on a nationwide talent show performing Frank Sinatra songs in front of music bigwigs and baying fans. Responded Dave, "On the whole, I think being on American Idol was a positive experience and it was certainly enlightening. Put it this way - the experience was great but it was also disenchanting in relation to the fame and celebrity side of things. I had a very small taste of it but, when you pull back the veil and look into the inner workings of what goes on in reality TV and the world of celebrity, it's very ugly, cut-throat and dog-eat-dog. Everyone's straining to get to the top. Seeing that was a real wake up call for me." So what led to Dave and Licia working together as The Gray Havens? Explained Dave, "We didn't actually sing together until we were engaged and, even then, not all that much. It wasn't until after we got married that we talked about being in a duo together. We ended up recording our first EP and began touring together." Not unlike American Idol, Licia tends to act as a one woman panel of judges when it comes to any songs that Dave offers up. "Currently, I do all the writing and Licia either gives the thumbs up or thumbs down. I trust her judgment a great deal and I rely on her feedback. Sometimes she'll say the song's great or it could be better and I'll go away and work on it a bit more if that's the case. I think every writer needs someone like that." As if on cue, Dave and Licia's baby son Simon gave a hungry cry and I asked Dave whether the new addition to the family will affect the touring life of The Gray Havens. "We've been inspired by the likes of Josh and Michelle Garrels, Jenny and Tyler Somers, Sara and Troy Groves and other couples who have made it work with kids on the road and they've proved that it can be done. We plan to go on the road with Simon in the fall and start slowly but try to do as many shows as we can." In fact, it seems that Dave has no intentions of slowing down as he explained in closing. "I'm in the process of writing the next record. Here's my problem - I've got all these song sketches which I've probably spent too much time on and now I've got to hammer out those lyrics. I might be going on a lot of long walks to get them finished!"